Freestanding electric stoves offer the instant ambiance of a traditional fireplace experience. Each of our freestanding electric fireplaces provide quiet, instant heat and eye-catching design. 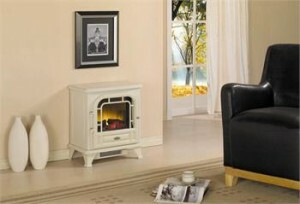 You will find electric stoves with both classic and traditional designs that will complement many decors. Can be used indoors, outdoors, even in your RV! Electricity rates vary from place to place. For comparison;electric fireplace manufacturers regularly advertise running costs of 17 ¢/hour. Electric Fireplaces Direct and Mantels Direct are authorized distributors of ClassicFlame Electric Fireplace products including electric fireplace mantel packages, electric fireboxes, electric inserts, and electric stoves. This is a free standing unit, no venting is required and can be placed anywhere in a room.